Construction Loans in CT. Make it a reality with 100% Financing. Newtown Savings Bank is one of a few lenders in Connecticut that still offer a construction to permanent loan program and is one of the top construction loan lenders in the state. This unique program features just one closing that combines construction financing and permanent financing into one loan. Finance up to 100% of the cost of construction. Lock in a rate prior to closing that will hold for both the construction period and for the conventional loan (adjustable rates loans for initial period). Construction loans can be used to purchase land as well as rehabilitation of existing structures. 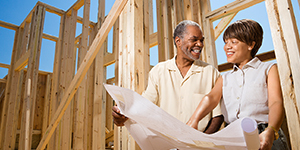 We can make your dream home a reality with our one-step construction loan. Our Mortgage Bankers have extended hours and are available weekends until 9 pm. Call 844.NSB.Loan.